It’s become a yearly ritual for me. 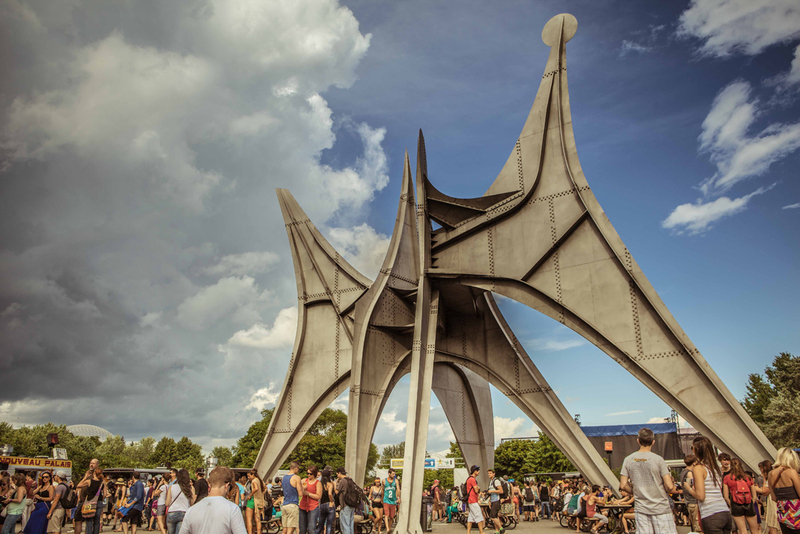 All roads in early August will lead to Montreal’s Parc Jean Drapeau for a year’s worth of auditory jubilation, delectable eating and feverish festival fun. With back-to-back record-breaking years in attendance, it’s clear that Osheaga has embedded itself onto the list of North America’s premier music festivals. That could not have been possible without a consistently strong lineup of performers, a proper venue and a magnificent host city. Just like any popular festival, Osheaga has brought in the best performers that people want to see. The list of award-winning and world-renowned headliners that have capped off each evening isn’t just extensive, it’s exhaustive. In only eight years of existence, closing acts on the River Stage include Sonic Youth (2006), The Smashing Pumpkins (2007), The Killers (2008), Yeah Yeah Yeahs (2009), Arcade Fire (2010), The Flaming Lips (2011) and Snoop Lion (2012). Even though Osheaga 2013’s lineup was a notch below 2012’s edition, each night still peaked with a marquee band from one of three different eras playing to a joyous crowd of devotes and music aficionados alike. The Cure, Beck and Mumford and Sons each gave a performance that – based on the crowd reaction – was well beyond expectations. However, as any frequent festival goer knows, a set of good headliners does not guarantee a good line up. Osheaga has traditionally rolled out a schedule across the spectrum of genres, with established and rising acts alike. Despite a rash of last-minute cancellations (particularly to the chagrin of hip-hop fans), 2013 still maintained that course. Parc Jean Drapeu is a beautiful site worth seeing, festival or not. 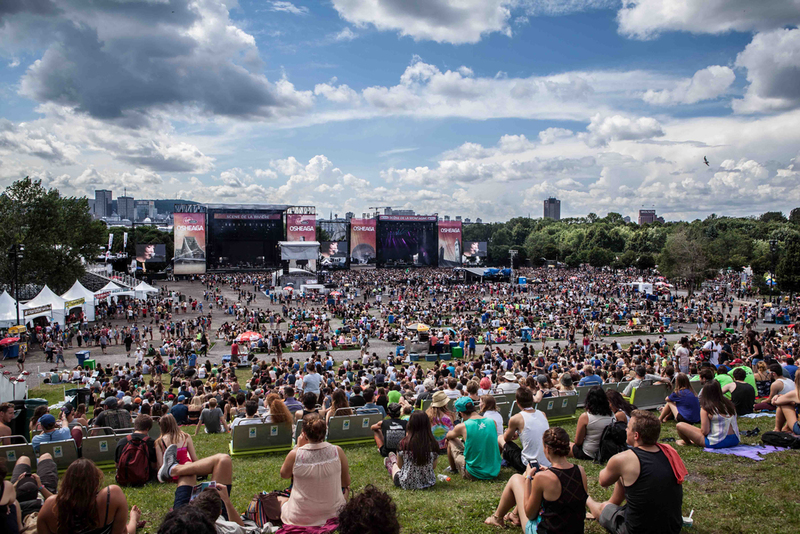 With beautiful greenery surrounding you until the trees part, the view of downtown Montreal beyond the main stages is especially climactic at night when the forest around you and the skyscrapers in the distance omit a hypnotizing glow. This year’s festival outdid any of the previous events in a few key areas. Aesthetics and flow were the most notable. With fewer traffic jams and stunning décor, everyone was happier. The food at Osheaga 2013 was dramatically improved by the inclusion of Montreal’s finest food trucks. Not only could you now get everything from a gourmet burger by Winneburger to a fruit filled waffle at Gaufrabec, but you also had more food stations dispersed about the festival site. What’s more, Osheaga partnered with Chevrolet for the most unique social (social in both real life and digital) festival experience to date. The icebreaker tactic randomly paired two participants at the festival via a numbered wristband. The challenge was to use social media (when there was actually cellular service) and your eyeballs to find your matching number. Of course there were prizes, but none were as memorable and long-lasting as the new friends – unless maybe you won the car. 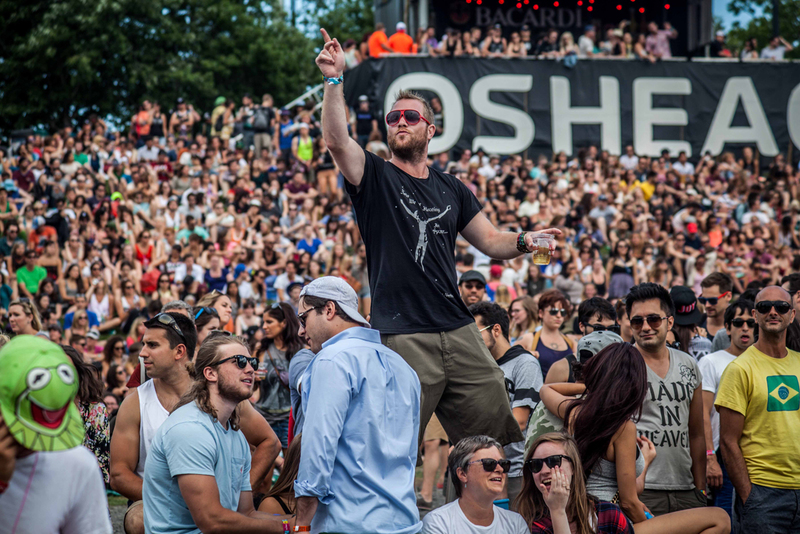 Going to Osheaga is about much more than the music. 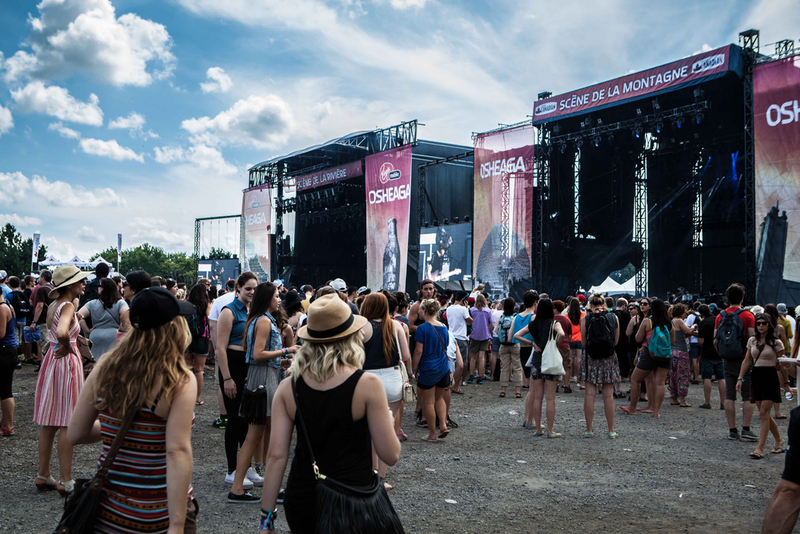 Unlike other marque North American festivals held in rural places like the deserts and farmland, Osheaga releases its attendees into the dynamic streets of Montreal. Even though the music is the centerpiece of your itinerary, Canada’s second largest city itself will host the core of your memories. First on the list is Old Montreal. Nothing is more charming than narrow, cobblestone streets, of which you find plenty in this historic neighbourhood. You can also find plenty of sights to see before the festival opens its gates, like the Notre-Dame de Montreal Basilica. Drop by again in the evening to Old Montreal’s Place Jacques-Cartier for some adult beverages and hearty appetizers, too good to be late-night food in any other city. Restaurant À l’Aventure’s brew selection, outdoor seating and exceedingly friendly staff make it particularly inviting for reliving Osheaga’s highlights with friends old and new. 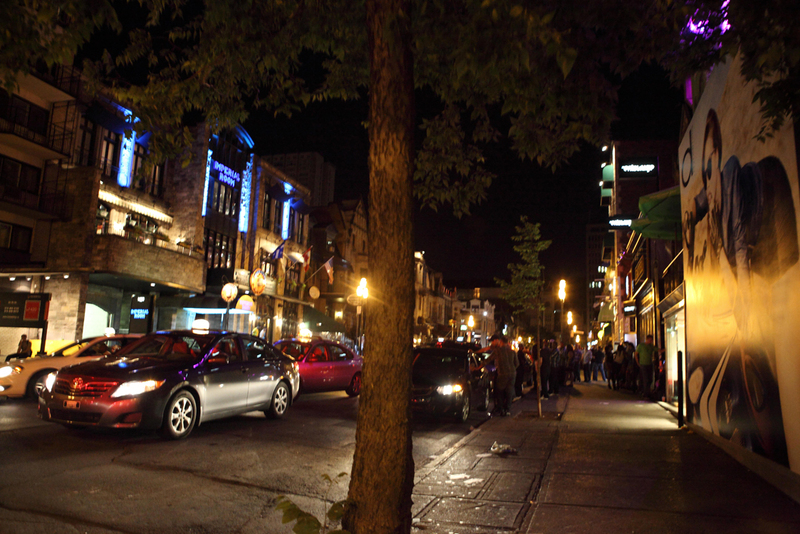 If you want something more raucous, take a stroll up Saint Laurent Boulevard past Sherbrooke Street. You’ll soon be dancing either in the dozens of pubs, taverns and clubs lining the boulevard, or on Saint Laurent Boulevard itself when you leave the watering holes. For a taste of the glitz without doling out stacks of cash, try A GoGo Lounge. It’s a glowing, vibrant throwback to the 1960s and 1970s, right down to the quirky lighting and novelty barstools. That doesn’t mean this is an old-timers destination since the DJ spins a lively, contemporary mix that you might just have heard on Parc Jean Drapeau. The dance floor will fill up quickly. A GoGo Lounge can be a tight squeeze on a busy night, but since you’re in town for Osheaga, why would you want to leave a place that has its menu on vinyl? A bar this hip is bound to lead to a fun night. After live music all afternoon and evening, then a night on the town, take a deep breath and set your alarm early. Montreal will fulfill one more appetite of yours, this time with food. Brunch at Restaurant Holder will leave you craving a second helping until next year’s Osheaga. On McGill Street in Old Montreal, you will find the best variety of French toast in North America. Resembling potato strips more than French toast, the sweet-battered bread strips are dampened with a succulent caramel rum sauce and accented by shredded Granny Smith apples. Don’t be afraid to fill up since you’ll burn off the calories running from stage to stage later. If you want an equally lavish dinner off of festival grounds, head back to Old Montreal’s Da Franco Italian restaurant. If you grew up in an Italian family, you’ll know pretty quickly that Da Franco is family owned, and for once, might admit that a restaurants Italian food is better than your grandmother’s. The Manicotti Alfredo bursts flavourful cheeses across your pallet and can be accompanied by luxurious red wine. Beyond the festival’s music and activities, and the city’s food and booze, what makes a festival great and most memorable are the bonds that are strengthened and the friendships that are founded. It’s a festival necessity to be good to each other. You’ll end up making connections with locals willing to show you the underground nightlife scene, or new Facebook friends you’ll reunite with on a vacation. If you’re lucky, you’ll have your best friends alongside you from home the whole time. Sure, spending a long weekend together could be tense by night number three, but oh the stories you’ll have to tell after a festival done right – a festival like Osheaga. Lucas Mariano is a cultural hipster with an appetite for luxury. While pursuing a chic, city lifestyle, he keeps his earbuds plugged into the urban up and coming. Lucas wants to be the first to tell you about a trendy band to download from iTunes, a breakthrough smartphone that’s coming soon, or a posh spot for nighttime nonsense. Since his graduation from Penn State University in 2009 Lucas has used his Journalism degree to live a mobile life. By car, bus or plane, he has ventured all over North America for a glimpse at cultural singularities. In addition to documenting city life for The Antidote, his work has appeared in publications across the Southeast United States. If you see Lucas in your city, stick close to him for a lead on a swanky vacation or a hip concert. He might invite you along.